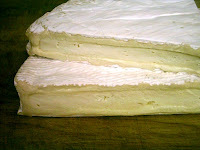 Over the last several month's I have made a foray into the world of cheese. This all started when Kathi was telling me about a cheese shop that used to be at Tower plaza, when Tower plaza used to be where it isn't. She was reminiscing about her memories of her father buying cheese there and how good it tasted. The cheese in question is called "Danbo" a Danish cheese. I located a seller online at Igourmet as there appear to be 0 (zero), none, nil "cheese shops" in Phoenix, and the places that sell "exotic" cheeses did not carry it. I ordered 2 pounds of Danbo, one with caraway seeds and one without. I'm not snooty enough to boar you with how self absorbed I might be with grand descriptions of all the wondrous flavours one might find in partaking of cheesy comestibles. I'll keep it closer to home. Danbo smells like Mike's (or anyone else's) stinky feet. The taste is similar to a very, very sharp cheddar. thankfully it does not taste like it smells. I didn't much care for the one with caraway seeds. The next cheese was "Havarti". 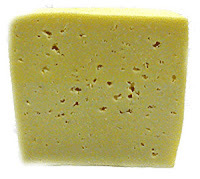 This cheese was an attempt to copy Danish cheeses and was first made in the mid 1800's. The smell is very mild and so is the taste. It tastes good straight or melted. It also comes with caraway seeds. I bought some Presidente Brie. This stuff looks freaky but tastes pretty good. 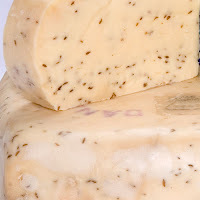 The rind of this cheese is a mold that is related to penicillin. The Rind is 100% edible and taste just like... hmm... well... MOLD (blech). 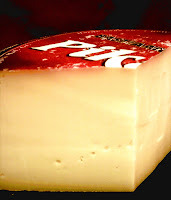 However the cheese itself is extremely soft, creamy, and tastes allot like unsalted, Velveeta (They're getting their torches and pitch forks in France now), with a very, very, slight ammonia aftertaste (in some brands). Next up Gouda. 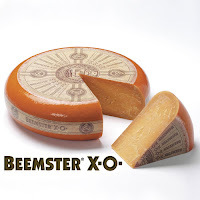 I tried 2 different kinds, a young Gouda, and Beemster XO (extra old) which I am partaking of as I type. This is definitely an old cheese. Igourmet reports it has "The flavor of butterscotch, followed by alternating waves of whiskey and pecan". Now I have tasted Butterscotch, Whiskey and Pecan, and this cheese taste nothing like those things. It has a STRONG but not unpleasant taste. There is a pleasant cheesy aftertaste. It does however have lots of tiny little white crunchy specks in it which at first I thought was salt, but I have yet been unable to identify. 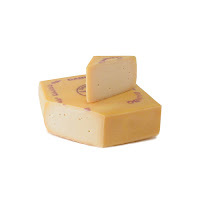 Regular Gouda is very smooth and tastes like a strong Muenster, Monterrey Jack, or Havarti. Chris and Mike like it melted on a hamburger. Cheese connoisseurs like wine connoisseurs go on and on about all the different flavors they find in their favorite indulgence. I have a pretty good sense of taste and smell. I can tell when milk has gone bad, long before anyone else can. I can tell you what the ingredients are in most prepared foods I have eaten, but the whole "this taste like, this stuff" and "this is reminiscent of whatever" is BS. Food taste like it tastes, don't try to "church it up". if you like it eat it. If it doesn't look or smell too disgusting try it. After many years of talking about it, we finally are back to camping. Once again we went up to Woods Canyon Lake this time with Chris, Amanda, Mike, Jamie, and Sean. On Friday I picked up Chris and Amanda and their "stuff" at 14:00. That's when I knew we were in trouble as their "stuff" completely filled the bed and back seat of my truck. Most of our "stuff" was packed in the trailer but some of it was going to have to be put in the bed of the truck. Since I didn't want my truck (which would be hauling a trailer) to have to carry an additional 500 to 800 pounds, and Mike's SUV would be packed with his "stuff", we decided to load up Chris's "stuff" in Kathi's car and they would drive to Payson. This time we managed to load up our 2 cars and leave on time at 15:00. Mike could not leave until he was off work. Chris had thrown his back out last Sunday hanging "Halloween" lights, so he had been off all week. The trip up was uneventful. We arrived on the rim, filled the water tanks in the trailer at the dump station and managed to get 2 camps sites next to each other. Even though we left at 15:00 we still only got there about 45 minutes before sunset, because of winter coming we forgot the days are getting shorter. We did manage to get camp setup before it got dark. Mike who had not been able to leave until about 17:30 arrived at about 20:30. Much loud cussing ensued (from Mike and Chris) as we set about putting up Mike's "20 man tent" (it's a long story he can tell you about as to why he has a tent that big). Once his tent was setup and all had been fed we retired for the night. After everyone had thoroughly froze during the night we all woke with the sun. I got up first and started a fire. We made breakfast, Mike, Chris, and I set off to fish and hunt for crayfish. The girls (and Sean) went into town to spend money. We fished for several hours and took turns hunting crayfish. As the clouds couldn't make up their mind to stay or go, we alternately froze and fried. 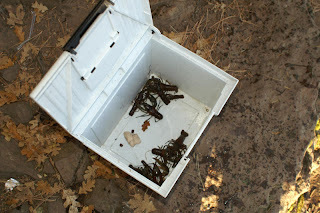 We caught zero fish and several crayfish. at 11:00 we returned to camp with many large crayfish, and had lunch (no we didn't eat the crayfish at this time). At 13:00 we went back to the lake but it was cram packed with people. 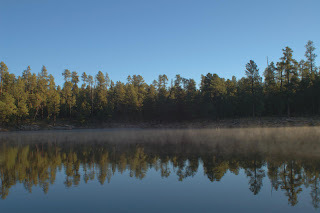 We decided to go to Willow Springs lake a couple of miles down the road. We hiked up the shore line for about a mile but were surprised to find not only NO crayfish, but NO minnows, very little plant Life, and the water was extremely clear. So we hiked back to the car and went back to camp about 15:00. That night we had steaks for dinner. Mike, Chris, and I then went back to the lake at about 17:30 to place our traps over night and to hunt for more Crayfish. We walked up and down the lake edge with flashlights and caught about 6 more. I had brought an aquarium aerator with me. I put the crayfish in a bucket half full of water. submerged the air tubes from the aerator in the bucket, and hooked it up to an inverter connected to a car battery and stuck it in my truck. I did this so the crayfish would "purge". Around 20:30 most of us retired for the night. Mike and Jamie however went to Payson and returned some time after 23:30. It was about this time that an Elk bugled and woke me up, this was followed by Sean crying (not because of the Elk). Mike and Jamie in their Ginormous tent got too cold, and so on this night they slept in their car. All through the cold night the Elks announced the time, in their elky way. 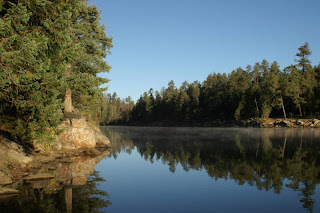 The next morning Chris and I leaped out of our cold beds, Started a fire, and went down to the lake to retrieve our traps. 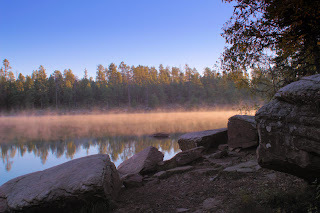 It was a cold morning and mist was coming off of the lake. I took a few pictures.